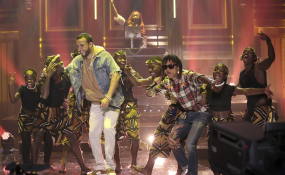 "Unforgettable" hit-maker French Montana is a man with a big heart. He filmed the video of his hit song in Uganda after visiting the children who appeared in Eddy Kenzo's "Sitya Loss" hit and also featured them in his video. So moved was he with the plight of the children that he decided to build a hospital to help them. Teaming up with fellow singer The Weeknd, Montana made a donation of 100,000 dollars (Sh10.2 Million) while the latter donated 77,000 dollars (Sh7.9 Million) to Mama Hope Organization to put up the facility in the remote area of Suubi. Six months later, the facility is in its final stages of construction. In a special video post that French Montana uploaded to his Instagram account recently, a lady presumably the head of Mama Hope Organization, shows the rapper the nearly complete health centre . Its shows two constructions where one will serve as the doctors and medical staff quarters while the other will be the health centre that will serve 260,000 people. French obviously excited by his work, he captioned the video "WOW!! I love hip hop and the platform it gave me. Things like this make all the blood sweat and tears worth it. I really had to stop talking and take action. Still amazed at the process! I can't take all the credit shout out to Mama_Hope @glblctzn and my brother @theweeknd and the beautiful people of Uganda"
This development comes just two months after Montana paid air tickets for the nine Ghetto Triplets dancers ages between 9-16, to the US where they performed alongside him at the 2017 BET Awards.